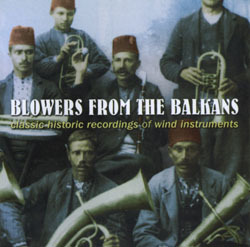 Blowers from the Balkans presents a remarkable collection of historic recordings from virtuoso players of wind instruments from the countries that make up the Balkans â€“ Greece, Bulgaria, Romania, Albania and the newly independent parts of the former Yugoslavia. The recordings were made over a period spanning from the 1906 through to the mid 1940s. All have been re-mastered to the highest standards to produce outstanding sound quality. â€¨â€¨The featured instruments include clarinets (and related reed instruments), panpipes, bagpipe and flutes with a variety of backings and the package is completed with detailed notes from the compiler Risto Pekka Pennanen as well as historic photographs.